-With the win, Los Angeles improved to 60-35-15 all-time against Washington, a record that includes a home mark of 35-14-7. The Kings have won eight straight home games against the Capitals, dating back to a 3-2 loss at Staples Center on December 14, 2005. Los Angeles registered the eighth season sweep of Washington (min. two games) in franchise history (also 1986-87, 1989-90, 1995-96, 1998-99, 2003-04, 2008-09, 2013-14). -With the win, the Kings improved to 20-9-1 against the Eastern Conference, 9-5-1 against the Metropolitan Division, 10-9 in two-goal games, 19-3-2 when scoring first, 14-3-2 when leading after one period, 21-2-1 when leading after two periods and 20-10-2 when outshooting their opponent. Los Angeles has two games remaining against Eastern Conference teams, both of which take place at Staples Center: Thursday, March 15 versus Detroit and Saturday, March 17 versus New Jersey. -By extending his career-high to 14 goals, Trevor Lewis tied his career high in points with 25 (14-11=25), which he had set in 2014-15 with nine goals and 16 assists. -Jeff Carter (1-1=2) registered his second multi-point game of the season. Since returning from injury, Carter has five points in six games (4-1=5). -Tanner Pearson (0-1=1) extended his point-streak to three games (2-1=3). 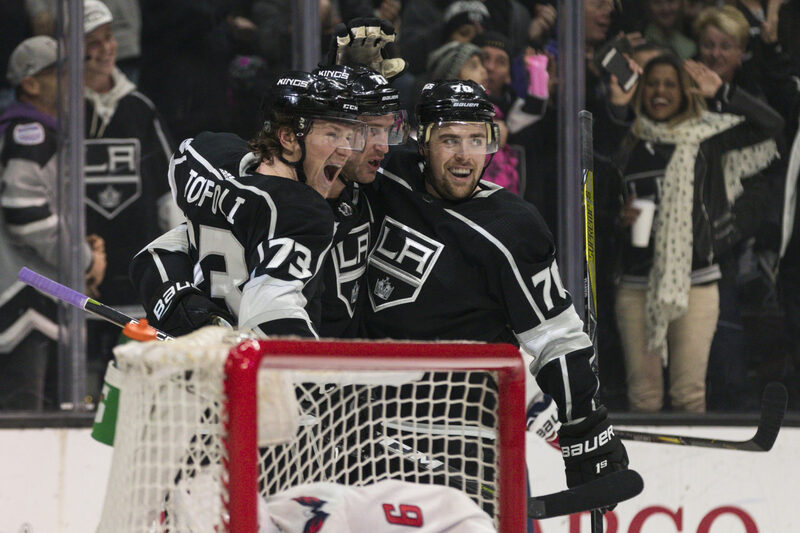 -Jonathan Quick stopped 25-of-26 shots to improve to 9-2-0 in his career against Washington. -Alex Ovechkin (0-0=0; -1) registered a game-high nine shot attempts (3 on goal; 3 blocked; 3 missed). In 17 career games against Los Angeles, he has five goals, 13 points and a minus-six rating. -The Kings attempted 55 shots (29 on goal, 8 blocked, 18 missed). The Capitals attempted 56 shots (26 on goal, 13 blocked, 17 missed). Trevor Lewis led all skaters with four shots on goal. -Los Angeles won 37-of-55 faceoffs (67%). Adrian Kempe won 0-of-1, Anze Kopitar won 13-of-17, Nate Thompson won 8-of-10, Michael Amadio won 5-of-9, Torrey Mitchell won 0-of-1 and Jeff Carter won 11-of-17. The Kings are scheduled to practice at 11:00 a.m. on Friday, March 9.